I read this article and found it very interesting, thought it might be something for you. The article is called Your Guide To Hindus, Muslims And Intolerance and is located at https://archive.indiaspend.com/the-transition-2015-2016/your-guide-to-hindus-muslims-and-intolerance-96868. What was the intolerance debate that roiled India this year about? * Was it about the ruling Bharatiya Janata Party (BJP) leaders–and Hindu villagers— declaring that a 50-year-old Muslim lynched to death on suspicion of eating beef deserved it? * Was it about the Shiv Sena–one half of the ruling alliance in India’s most-industrialised state–demanding that the voting rights of Muslims be revoked? * Was it about actor Aamir Khan–and other actors, mostly Muslim–being attacked (he defended himself here) for remarks on intolerance? At the heart of the debate was religion, with fears of a growing tide of majoritarianism and new realities for minorities, specifically Muslims. And at the heart of the debate over religion was the contention that Muslims would one day overwhelm Hindus, a contention not supported by data. However, PEW, a global research organisation, said in this report that Hindus are younger, on average, than the global population. “So, combined with an increase in life expectancy, the Hindu population will rise even with below-replacement fertility,” the report said. The fertility rate for Indian Muslim women fell from 4.1 in 2001 to 3.2 in 2010 and is expected to be 2.1 by 2050. Hindu fertility rates are 2.5, expected to fall to 1.9 by 2050, below the replacement level of 2.1, the PEW report said. The Indian government released India’s census data on religion in 2015, after a delay of almost four years. The proportion of Hindus declined marginally to 79.8% at the end of 2011, from 80.5% at the end of 2001, IndiaSpend reported in August. The percentage of Muslims increased to 14.2% in 2011, from 13.4% at the end of 2001. While India’s population growth was 17% in the decade between 2001 and 2011, Muslim population was at a 20-year low of 24.6% in 2011, we reported, using census data. Hindu population growth was down to 16.75% in the decade ended 2011. India has 966 million Hindus (79.8%) and 172 million Muslims (14.2%), we reported. The intolerance debate heightened in 2015, when over 50 authors and artists returned government awards, saying not enough was being done to control intolerance. 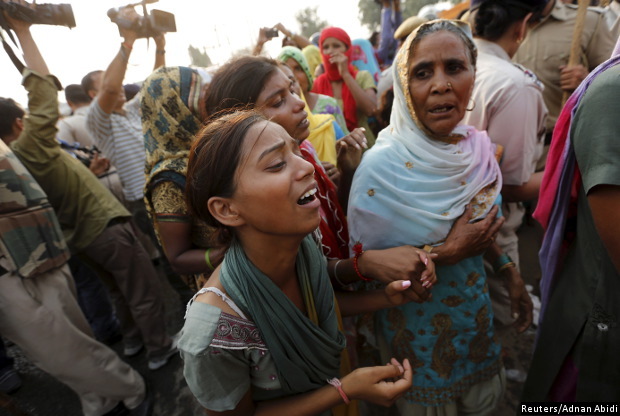 A trickle of returned awards turned into a tide when Mohammad Akhlaq was lynched in Bisara village in Uttar Pradesh, India’s most-populous state, which accounted for a fifth of all religious conflict nationwide between 2010 and 2014, IndiaSpend reported. India has witnessed more than 3,400 communal incidents over the last five years; 529 people died and 10,344 were injured. But the data depended on which arm of the home ministry released it. The home ministry and National Crime Records Bureau, a department under the ministry, published differing data for communal riots in 2014. While home ministry data said there were 644 communal riots last year, NCRB data said there were 1,227 clashes, Factly.in, a data journalism portal reported. So, much attention is focussed on whether such riots have increased or decreased since Narendra Modi took over as Prime Minister in May 2014, IndiaSpend reported.